The linkage of politics and technology is now the driving momentum in communication. Publishers are now part of the astonishing transformation of the slow to the instant. From twitters to bloggers, the communication of ideas can now be accomplished in a matter of minutes, not weeks, months, or even years.Horowitz believes that at its best, information technology can be harnessed to facilitate the expression of democratic thought. In providing better access to production and technology, there is great hope to liberate humankind from ignorance and ideology—and imagination is what the purpose of publishing is and always will be about. 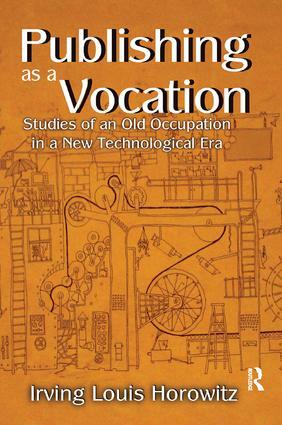 If politics is the art of the possible, then technology can be harnessed to the higher art of transforming scientific principles into everyday practices.Publishing as a Vocation places publishing in America in its political and commercial setting. It addresses the political implications of scholarly communication in the era of new computerized technology. Horowitz examines problems of political theory in the context of property rights versus the presumed right to know, and the special strains involved in publishing as commerce versus information as a public trust. Offering a knowledgeable and insightful view of publishing in America and abroad, this book makes an important contribution to the study of mass culture in advanced societies.